Today is my one year blog anniversary! I started out with a heck of a lot of enthusiasm, but not a lot of know-how in spite of years and years of web development experience. I am so excited that I’ve kept it up and the fact that I managed to rack up over 300 (THREE HUNDRED!) posts that are almost all about creative things you can do with your kids. How cool is that?! To celebrate I’m giving away a beautiful dress in size 4 by WATI Designs (pictured above). It was generously donated to a cool swag bag I received while at the BlogHer conference, but is sadly way too small for Maggie (who has been drooling over it, and trying to convince me that she could fit in it — she’s size 7-8). So, if you have a four year-old in your life who would enjoy this, or know one who would, please join in on the fun! 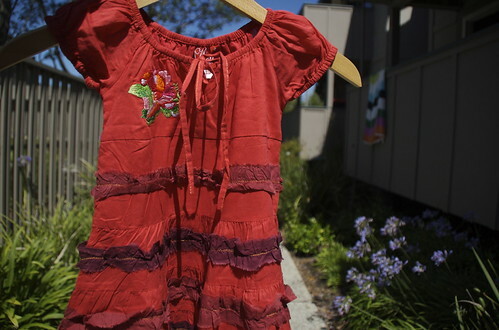 Feel free to pass along the link to other Moms and Dads who might like to win a gorgeous dress and find creative inspiration for kids’ craft time. I’ll leave this post open for comments until Thursday, August 2nd at 11:59PM PST (I figure two full days should be plenty to give folks time to head over here). On Saturday morning I’ll have the kids pick a name from a hat (or bowl) and announce the winner here and via email to the lucky winner. Hope you had fun at BlogHer! I thought this year was the best one yet. Emily wears size 4 and would look great in that dress. Please enter me in your drawing. Happy Blog Anniversary and keep up the good writing. My favorite idea from you is the table-top tent. The kids love it! What a gorgeous dress!! My four-year-old would never stop twirling! I love fun contests… especially for such a great prize! Happy happy blogiversary! You’ve brought us much joy. Happy Blogiversary! Love the dress – my four year old would look cute cute in it and my two year old waits patiently for hand me downs. Here’s to another wonderful year of fun and inspiring ideas! WOW! I just got lost in all the links, looking at your swag bag stuff. very neat things! I’d love to hear how you like some of them. Happy Anniversary! 300 post is amazing and the dress is adorable! Keeping my fingers crossed for the dress and wishing much happiness with your next 300 posts! Didn’t make your deadline for the giveaway, but want to congratulate you on the big 1 and tell you how much I love Little Elephants and enjoy reading about your life with your kids. I was going to comment to this with a link to a photo of my daughter in her T-shirt she painted after I was inspired by one of your projects, but I’ve been too slack to actually take it yet. still, i wouldn’t want to post the dress over here anyway. Just to echo other people’s comments – I always enjoy visiting your blog and keep up the good work.